13/10/2006 KIRSTY WEST BECOMES CHESHIRE CHAMPION! 20/09/2006 WORLD CHAMPION IS OUR SECRET WEAPON! 18/02/2006 ROD BOS - BRITISH NATIONAL OVER 60 CHAMPION! 14/11/2005 7 IN A ROW? 03/11/2005 6 IN A ROW! Runaway leaders, Chester, crashed to their first defeat of the season last night at the hands of Yawar and his team. The night started well as Ky Hibberd turned his match around in dramatic style against the British Over 45 Champion, Nick Gatwood. The sublimely skilful Gatwood totally dominated the first 2 games, consistently forcing Ky onto the back foot. But after a hard fought rally at 4-4 in the 3rd the game suddenly swung. Ky got forward, applied the pressure and finished the match clinically. Morgan was also up against a National Champion (O40), Jonathon Clark. He came back from 2-0 down to take the third decisively and got a good lead in the fourth with some excellent play. Clark, though obviously feeling it physically, really dug in and just managed to close out the game 10-8 and take this high quality match, 3-1. If Morgan had taken that game he would probably have won the match. Yawar fought back to win from 1-2 down in combative match against Mike Waight before Liam lost in three to talented youngster, Alistair Mutch. 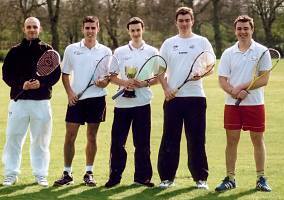 This meant the match would be decided by the No.1 strings, Andy Whipp and the former World No.14, Nick Taylor. The first game started at a high tempo, with both guys playing their trademark aggressive games. They matched each other point for point but Andy just had the edge and took it 9-7. Taylor, who is the favourite for the national O35 title next week, needed to win that first game as his body struggles to cope with this standard of squash since he retired from the tour. From then on there was only going to be one winner and Whipp duly took it in straight games to hand Grove Park a famous victory. KIRSTY WEST BECOMES CHESHIRE CHAMPION! 17 year old Kirsty West won the senior title of the Cheshire Closed for the first time. The Grove Park starlet beat Rachel Chadwick 3-2 in the final held at Warrington at the weekend. It is though that she could be the youngest every winner if the title. She'll add this to her impressive record of winning the Cheshire title at each of the junior age groups. WORLD CHAMPION IS OUR SECRET WEAPON! GROVE Park squash club have a secret weapon that they believe could help their men’s first team become champions - a woman. Five times World Champion Sarah Fitz-Gerald will play for the Stockport-based club’s men’s team this season. Fitz-Gerald stopped competing on the world stage in 2002, the year she clinched gold at the Commonwealth Games. Advertisement"I chose to retire after an awesome year," explained Australian-born Fitz-Gerald, who began playing the sport aged six. "It was the right time for me to retire, but while I can still play I want to continue doing so." Fitz-Gerald played for Chester in the national leagues prior to joining Grove Park, who compete in North West Counties top division. Park’s chairman, Steve Husdan, is thrilled to have a former world champion playing for the club. "To have a world champion takes us to another level," explained Husdan. "It elevates everyone and there is a buzz around the club." Fitz-Gerald is not the only new member of the five-man squash team, the return of 26-year-old Andy Whipp is also a boost. Since first taking up the sport at Grove Park aged 10, Whipp has swept up the rankings and is now in the top ten in England. The Park side, captained by Yawar Abbas, finished fourth in division one last year but Husdan believes the bolstered side could be destined for success this season. "With Andy and Sarah this year we think we have got chance of becoming champions," he said. "The first team set the standard for the rest of the club." The team opened their league campaign last night (Tuesday) against newly-promoted Bowdon. Fitz-Gerald added: "We should do pretty well, although there is one other team that I believe will be exceptionally strong in the league this year." Attracted by the atmosphere and acquaintances at Grove Park Fitz-Gerald, who lives in Poynton, regularly travels back to Australia meaning she will be unable to play in every match. Fitz-Gerald will be taking part in World Masters in Cape Town from October 15 to 21, Grove Park colleague Rod Boswell will also be taking part. GROVE Park ladies are hoping for another successful year. The team won Cheshire division one last season, and were runners up in the England Squash National Cup during the summer. If you are interested in finding out more information about the club or to become a member call 0161 485 3733. Jenny Dixon - First published by the Stockport Express. Grove Park Ladies narrowly missed out on winning the inaugural England Squash National Cup. The competition involves the winners of all the county leagues. As Cheshire Champions, they qualified for the finals at the National Squash Centre, Manchester by beating Lancashire's Clitheroe 4-0 in the North West play-off. The Weekend started off well with a 2-1 win over the South West's Haymoor with comfortable wins by Laura Mylotte & Anna Vaughan. However later that day they were beaten by the eventual Champions, Wimbledon, by 2-1. Laura gave Grove Park a good start but both Hilary Kenyon and Anna could quite convert in tight 3-1 matches. Second place in the country was secured the next day as they closed out Leeds' club, Chapel Allerton, 2-1. Grove Park swept to victory as they took both the Men's and the Ladies Championship of the Cheshire Cup 2005-06 (and came runners-up in the Ladies Challenge Cup, just for good measure). In the finals held at Warrington Sports Club, the Men's team, completed a convincing 5-0 victory over Hyde CC to retain their title. Wins for Laura Mylotte, Al Atkinson and Steve Davies at 3,4 & 5 secured the trophy before Liam Foster and Chris Matthews completed a great performance with wins over Steve Gregory and Steve White. The Ladies meanwhile took the Ladies Championship with a 3-0 victory over Village Hyde. Anna Vaughan gave Grove Park a good start by winning at three before Hilary Kenyon came back strongly from a poor start to win the second string match 3-1 and claim the title. That left Laura Mylotte to win easily at No.1 to complete the unique acheivement of winning the Mens & Ladies Cheshire Cups in the same day. The day didn't go all Grove Parks way though, as the ladies Challenge Cup team lost narrowly 2-1 to Woolston, who had won the Division 2a League Title without losing a match all season. Nat Husdan's win at No.2 took the tie to 1-1 after Jean Boston had earlier been beaten. However, the Woolston No.1 was just too strong for Sue Pettigrew in the decider. The Challenge Cup is open to players who haven't played above Division 2. Ladies No.1 Becky Botwright is profiled in the Daily Telegraph. Grove Park Ladies 1 have now built up an unassailable lead at the top of the table with two games to go and will be crowned the Cheshire Ladies League Champions 2005/06. This is an incredible achievement considering they faced automatic relegation just 3 years ago because they didn't have enough players to avoid a walkover. It is also Grove Park's first Division One title since 1983/4, so congratulations to Becky Botwright, Laura Mylotte, Hilary Kenyon, Anna Vaughan, Liz West, Chris Kenrick, Helen Tipping and Sue Pettigrew. Read the story in the Stockport Express. Last night the First Team moved back up into 2nd position in the league after great 4-1 (17-6) win over local rivals Prestbury, who had overtaken them the week before. Liam Foster came back strongly from a shaky start to beat Nick Murrills 3-1 and Yawar Abbas continued his great form with a comfortable 3-0 win over Glen Ragou. Nathan Langley started out like a steam train, conceding just 3 points in the opening 2 games before allowing Mike Dickens right back into the game to level the game at 2 all. The momentum in the tightly fought fifth game continued to swing either way. As the game drew to a conclusion, neither player were able to capitalise on a number of match balls. However, Nathan eventually managed to close out the game 10-9 to record his 17th win of the season. The successful night was completed by No.1, James Wright, beating Chris Ryder 3-0 to avenge his 1-3 defeat in the first half. Prestbury's only win came from the steady, Steve Siviter, who beat Robbie Temple. Can Grove Park claim a 3rd National Champion in a matter of months? To add to Laura's Irish Title and Rod's Over 60 title we're going to add Patrick Foster's Bermudian National Title. Patrick who took up a coaching job in Bermuda last February won the Bermuda National Closed Championship last week (and it's slightly harder than you might think). In fact, Bermuda can boast two touring professionals and Patrick rolled back the years to beat the World No. 71, Nick Kyme, 3-1 (11-9, 11-9, 5-11, 11-8) in a pulsating final in front of a full house. Read the article from Bermuda's Royal Gazette. ROD BOS - BRITISH NATIONAL OVER 60 CHAMPION! Grove Park stalwart, Rod Boswell, captured the Over 60 Title at the British National Championships in Manchester this weekend. Rod, who turned 60 in December cruised to a 3-0 victory in the final against skillful England International, Adrian Wright (Leics). Well almost. After dominating most of the match, he suddenly got a bit jittery at match ball and threatened to let the tricky lefthander back into the game as he had done in his hard-fought semi-final match the previous day. However, he regained his composure in time to close out the game 9-7 and take his first National Title with a trademark volley-drop. "I tried to keep it away from Adrian's forehand, as I knew that was particularly strong, and make him work." "As long as the body holds up my target now is to emulate Adrian and play for England, hopefully this week will have gone some way towards helping me achieve that goal*." "He's too fit. I'm too old." The National Championships also proved a fantastic week for Cheshire County. They managed to capture five National age group Titles making them, by far, the most successful County. In fact no other County even managed to win more than one Title. Along with Rod, the other winners were Nicky Fowler (W35), Jonathon Clarke (M40), Nick Gatwood (M45) and Catherine Woodhart (W50). *Rod has since won another ranking tournament in Pontafract and now has enough points to qualify him for the England Team in the Home Nations Championships. Grove Park's own Laura Mylotte claimed her first Irish National Title this weekend. Laura, seeded no.2 upset the seedings by beating the number 1 seed Aisling Blake (World No.52) with a hard fought 9/5 3/9 10/9 9/2 win in one hour and twenty minutes. Laura took the first, only to see Blake hit back to take the second an level the match. After a slow start Laura then gained an 8-4 lead in the third but Blake fought back to 8-8 all before Laura eventually closed the game out 10/9. From 4-2 in the fourth Laura broke away to take the game 9/2 the match and the title. The title is the highlight of her career so far (apart from the Grove Park Open Title she won in April of course!) and is a remarkable recovery from 3 years out with a severe knee injury which required surgery 4 times. "I'm delighted to have won." "I have worked so hard over the last couple of years after returning from injury and this makes it all worthwhile." Despite great wins by Yawar Abbas & Liam Foster, Grove Park couldn't overcome their rivals, The Northern. Come along to Didsbury on Tuesday to see the top of the table clash against our local and biggest rivals, The Northern. Comfortable wins over the last 4 weeks have consolidated the First Team in 2nd position in the table, however The Northern have been powering ahead and are still to be beaten this season. The First Team will be strengthened with the return of Irish International John Rooney at No.1. He will have the task of taking on Andy Whipp who has been in outstanding form recently including a 3-0 win over World No.25, Jonathon Kemp. The rest of the team should be James Wright, Yawar Abbas who has now gone 11 matches unbeaten, Liam Foster who has run into some fine form after a rocky start to the season and young Nathan Langley (now ranked England No.9 at U19) who has lost just one so far. STRAIGHT EIGHT FOR THE LADIES 1ST TEAM! The first team fought through the fog to get to Upton Leisure Centre and then fought off the challenge of their nearest rivals in Cheshire Ladies League Division, Cheshire County Officers. Admittedly the home team were without their number one but Grove Park, without Becky Botwright, but bolstered by new member Laura Mylotte, only dropped three games in their 19-3 victory. Laura, Hilary Kenyon and Anna Vaughan all romped home with a 3-0 win over their opponents (Janet Coleman, Lucy Benbow and Emma Woolley respectively); Liz West battled it out against Sian Hughes to win 10-8 in the fifth and Chris Kenrick let Helen Massey in for the third game but pulled through 3-1. Already 19 points clear before this game Grove Park now command the top of the table with a 35 point lead. Next week the first team are at home against Northern Crosby - so come and give them your support. Grove Park 1st Team couldn't make it 7 straight wins when they were beaten 4-1 by Prestbury. However, the Ladies 1st Team have a chance to go one better and make it 7 consecutive wins when they play, 4th placed, Village Hyde tonight. The ladies saw off fellow title contenders Warrington last week, leaving them 10 points clear at the top of the table. With the addition this season of Irish International Laura Mylotte to cover for World No.32 Becky Botwright and a much reinforced lower order, the team must now be favourites for the Cheshire Ladies Division 1 Title. See Grove Park Ladies 1 fixtures & results. Grove Park Squash Club have entered into a new sponsorship deal with online sports retailer www.racket-sport.com. Introducing the man behind Racket-Sport, Kevin Hodges. Just a few words to introduce myself to the members of Grove Park Squash Club. I am currently the Head Tennis Pro at Aylesbury LTC & SRC and captain of the men's second squash team (on a par with your 10th team!!!!). I have been involved with retail for the past 10 years, firstly as an agent for Wigmore Sports and now, under the banner of my own company - Racket-Sport.com Ltd. The company aims to provide quality brands at competitive prices, backed by a good product knowledge. More and more people playing racket sports find it ever more difficult to find equipment. If and when they do, the choice and product knowledge available, leave a lot to be desired! By specialising in this area, we are trying to make purchasing a much easier task, with the club Pro Shop and website, with online payment facility. Judging by the number of hits on the site, there are many people who are glad for this specialisation. So why Grove Park, when I am based "Down South"? This is a combination of reasons. Firstly, I was born in Bowdon, so I have that Northern connection. Secondly, I have the pleasure of being a good mate with Mike Andrews, who made me aware of the opportunity to sponsor this "Great club up North". Finally, it gives me the option to mix business with pleasure when I watch my "beloved" Manchester United! I have been up to my first Thursday experience and have to admit - it was like nothing I have been to before. I am coming up again this Thursday, to hopefully meet a few more people and witness the new team shirts. I am very much looking forward to meeting more new faces and enjoying another evening of quality squash and interesting post match analysis! If anyone requires me to bring any "goodies" along either email me at :kevin@racket-sport.com or speak to Mike. See you Thursday. Grove Park 1st Team extended their unbeaten run this season to 6 matches with a 4-1 win over Monton and now lie second in the table, 12 points behind Northern. The Northern, however, have already played the bottom three teams. Traditionally strong Monton have been struggling so far this season but arrived with a much stronger line-up. The match between Yawar Abbas and young irish international, Arthur Gaskin turned into a marathon. The first 2 games alone lasted an hour, but eventually Yawar came through to win 9-5 in the fifth and maintain his unbeaten record. James Wright started brightly to take a 2-1 lead against the very talented Laurence Delasaux but faded towards the end. Nathan Langley also recorded his six win of the season. He kept his head well to come through to win this ugly and controversial game 3-1. Chris Matthews marked his return to 1st team duties with a fine 3-1 win over one of Yawar's protégés, Ben Molyneux and Liam Foster comfortably rounded off the night. Grove Park 1st Team have got the new season off to a great start by recording wins in their opening two matches. New Brighton were beaten 3-2 in the first match of the season despite debutante, James Wright, having to retire injured. It was a cruel blow to James, who recently graduated as the British Under 19 No.2, as he had cruised to a 9-1, 8-0 lead before suffering severe stomach cramps. John Rooney however looks in good shape after missing all of last season through illness. He disposed of former National Champion, Phil Whitlock, in three games despite several interruptions. Match cards. They followed that up with a 3-2 win over the reigning Champions, Preston Grasshoppers. The match was decided when Ky Hibberd, filling in for Chris Matthews, came back strongly from two games down to win it in five. Earlier Nathan Langley and Yawar Abbas had both recorded impressive 3-0 wins against Darren Vescovi and John Lambert. 18 year old Robbie Temple couldn't quite make a winning debut as he went down 3-1 against Dave Barnett. Match cards. For the 2005-06 season, we have an exciting new coaching team lead by experienced professional South African coach, Dave Lane and Grove Park regular, Anna Vaughan (England Squash Level 2 coach). For more information click here or contact Martin Belshaw on mp.belshaw@virgin.net. Come along on a Sunday and give it a go! The new season kicks off on the 20th and 22nd of September. Full fixture lists are now available. 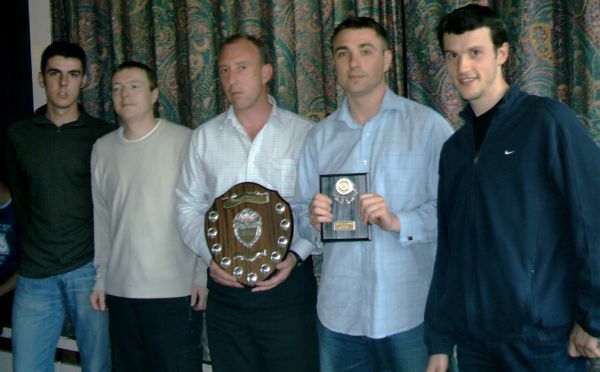 Grove Park 3rd team (Mark Mulligan, Murray Lonsdale, Jez Atkinson, Steve Davies and Alastair Atkinson) collected the Overall 3rd Division Trophy as well as their 3SE league title at the NWCSL AGM held at Warrington. Rod Boswell and Carl McColgan, who both played in the semi-final were unable to attend. Overall another successful year for the club. The first team finished a very creditable 7th Place in Division 1 , despite the loss of our top two players, John Rooney with glandular fever and Patrick Foster to a cushy number in Bermuda at Christmas. The highlight of the season being the progress of sixteen year old, Nathan Langley, in his first season with the club. During the course of the season we were also able to blood youngsters Ky and Morgan Hibberd to Division 1. They will be better for the experience. The second Team , under Iain Stewart, finished an excellent 3rd place in Division 2 having being in the running for the title with four matches to go. Iain's performances on a Thursday night led him to be named Player of the year . So our congratulation go to Iain. The Third Team led by Jez Atkinson had a tremendous season, winning Division 3 south east with close to 50 points to spare. Not content with this they went on to secure the NWCSL 3rd Division Title with a 3-2 win against Northern Crosby 2, despite missing No.1 Carl McColgan and Rod Boswell. A fine performance. The Fourth Team led by Steve Ward, had a solid year , securing their place in Division 3 for another Season. The Fifth Team under the stewardship of the "Electric Rat" - Paul Vale, pushed all the way , but narrowly missed out on promotion from Division 4. The sixth Team led by Dave Atkinson comfortably stayed up in the same Division 4 south east. The Seventh Team led most of the time by Terry Doherty - until he left us in the lurch with 2 games to go!!! - Stayed up in Division 4 South (just!!) aided by some sterling performances by our Club Chairman! The Eighth and Ninth Teams under Mike Bradford and Dave Cochrane had an excellent season finishing 4th and 5th in Division 5 Central East. The Tenth and Eleventh Teams had the weight of the rest of the division on the shoulders (i.e they finished as the bottom 2 in a very tough league) but they all had fun along the way and we were able to give a taste of team squash to a vast number of players. …and Finally but no means least for 2004/05 , Grove Park won the Cheshire Cup for the first time since 2001 by beating Warrington 4-1 in the final. Wins for Liam Foster, Nathan Langley, Mark Mulligan & Steve Davies made sure of the win. Last night Grove Park 3rd team secured the NWCSL 3rd Division Title with a 3-2 win against Northern Crosby 2, despite missing No.1 Carl McColgan and Rod Boswell. The night got off to a slow start as Steve Davies narrowly lost in 5 games, however the captain Jez Atkinson put his team right back in contention with a good 3-0 win. Murray Lonsdale used all his experience to record a comfortable victory against his young opponent at No.3 before second string, Al Atkinson, came back strongly from a game down to take the match and the title. They had qualified for the final a week ago by knocking out Glossop 1, with Jamie Maddox the only winner for the losing side. The Title is contested by the winners of the six Division 3 leagues. Grove Park won the Mens Cheshire Cup for the first time since 2001 by beating Warrington 4-1 on their home turf in the final. The Cheshire Cup is contested by most of the top clubs in Cheshire but are only allowed to field players who would be eligible to play for the county. After losing in the final for the last two years, wins for Liam Foster, Nathan Langley, Mark Mulligan & Steve Davies made sure Grove Park didn't make it three! The team had qualified for the final with comfortable victories against Crewe Vagrants and Winnington Hall (after Village Cheadle were forced to withdraw). Grove Park 3rd team secured the League 3 South East Title by 50 points and promotion back up to the 2nd division. They will get also get a chance at the overall 3 Division Title when they Glossop 1 on the 21st April. 16 year old, Nathan Langley (right) has been in outsanding form in the last few weeks. He has beaten the best two No.5's in the league, including Preston's Daniel Massaro who had previously gone 25 matches without defeat in the NWCSL! He has also won the GERRARD BRITISH JUNIOR U17 SUPER 8 GRAND PRIX, beating James Snell 3-1 in the final. The 1st Team cruised to a 5-0 (20-1) victory in their first home match of the season against Wigan CC. Wigan, who were without their top pros Adam Stevenson & Gary Thwaite, came up short against a very strong Grove Park side lead by John "Rooster" Rooney. Their only point came from Stuart Waddle who managed to take the second game off Liam Foster. The Grove Park Ladies will be adding a second team to their line up for this new season. Grove Park Ladies 2 will play in Division 2 of the Cheshire Ladies league which gets underway on Monday 4th October. The aim is to get enough players to create a 3rd team for next season and have a team in each of the 3 divisions. The return of Irish international John Rooney was enough to spark Grove Park into life and beat one-time title chasers Prestbury 4-1. Rooney was in tip-top form, beating Peter Hughes in three games, while team-mates Patrick Foster, Yawar Abbas and Liam Foster also won. 4-1. A Grove Park team featuring John Rooney at one, were just too strong for David Lloyd Manchester as they took the match 4-1. David Lloyd's sole win came from Yorkshire youngster, Shaun Le Roux, in a 3-1 win over Pat Foster at No.2. Though Becky Botwright (who plays for Grove Park Ladies) did run Grove Park's Chris Matthews close in a tight 5 setter. The result consolidates Grove Park in forth place in the table behind Prestbury who they play next week. Derek Ryan returned to Grove Park, but couldn't lead his Rochdale side to victory against his former team, despite recording a 3-0 win himself. The ten times Irish Champion and Grove Park favourite for 10 years, lead from the front by beating Patrick Foster. Even though just Henry Smit lost out 1-3, Liam Foster's come-back from 2-0 down and comfortable wins from Ammad and then Yawar secured a 3-2 victory for Grove Park against a Rochdale side who still have a bit of work to do to secure their place in the top flight next year. The Grove Park Ladies team has bounced back from a mid-season slump with 3 consecutive victories including good performances against the Northern and Alderley Edge. With just two fixtures remaining they will be aiming to finish a successful season in fifth or maybe even fourth position. With 8 matches remaining in the Powerplaysports NWCSL Division 1 race, is it shaping up into a two horse race between Preston Grasshoppers and Monton? But surprisingly they are both comparative newcomers to Division One with Monton only gaining promotion into last season and Preston the season before. Monton look to be the stronger of the two sides with Jordanian No.1, Mohamed El Said, British Junior Champion, Laurence Delasaux, and Northumbia Champion, Dave Barnett, playing regularly and the likes of the World No.56 and 61, Alex Strait and Liam Kenny, to come in at the top of the order for the big matches. Their only weakness seems to be at the bottom of the order which is highlighted by their habit of losing to lower ranked teams when some of the big guns are absent. Preston are just the opposite, without too many big stars at the top but very rarely do they drop points at 3,4 and 5 which makes them a very difficult team to beat. Prestbury, who lead the league for a large part of the season and were many peoples favorites to win the title, will have to work hard to make up the ground lost to the front two after a rocky patch around Christmas. Grove Park look like they will be scrapping for forth place with South Shore and possibly the defending Champions, The Northern, as they now seem to have recovered from a poor start. The Northern just managed to inch out Grove Park in a 3-2 thriller on Tuesday, with all but one of the rubbers going to five. Grove Park were on the back foot from the start with the late withdrawal of No.1 John Rooney who was needed in the Manchester/Pontefract National League team. This meant Patrick Foster moving up to the No.1 position to face Shahid Zaman, who is ranked no.40 in the world. Patrick rose to the challenge and played some incredible squash to go 2-0 up. However, after missing out on the third he started to fade as Zaman stepped up a gear and really showed his class to win in five. Liam Foster and Henry Smit both fought back through tough challenges from Christian Donelan and Joe Edwards to win 3-2, but the match had really been lost after Ammad Jawaid faded after leading Chris Clark 2-1 in a physical encounter. By the time Yawar Abbas (who had replaced Rooney) and Andy Whipp got on, the match had been lost. Ex-Grove Parker, Whipp, cruised through the match with Yawar not looking his combative self. They will be disappointed with another loss, especially to their biggest rivals, but a 10 points is a good consolation. After a disappointing return of only one win from the last the last four matches, Grove Park bounced back with a strong 4-1 win against Village Hyde. Liam Foster and the captain, Yawar Abbas, got the First Team off to a great start with fairly comfortably 3-0 wins. However, the match started to turn with Ammad Jawaid going two games down, Patrick Foster facing the prospect of the World No.26, Nick Taylor and Henry Smit (in only his third Divsion 1 match) facing a difficult task against Steve Gregory. An upset was on the cards. But Ammad managed to stay in the game by just taking the third 9-7 before moving up a gear to take the game in five and secure the match for Grove Park. Meanwhile Patrick was playing some great squash as he took the first game against Nick Taylor who was visibly tired after just returning from the Kuwait Open, but Taylor's class started to show as the intensity of Patrick's game dropped and came through to take the game 3-1. With the pressure now off, Henry really takes the game to Steve Gregory with some winners hit with incredible crispness and power. He goes two games up, but suddenly he starts to make mistakes to lose the third 1-9. The game subsequently swings from one side to the other as Gregory really digs in. Henry gets match point at 8-7 - he tinned it. All level at 2-2. The tension mounts as the crowd gets involved. After a tight start he opens a lead. He's looks like he's going to get this - the crowd relax a little. Another mistake! Gregory fights back level. Henry fights the urge to go for the risky winner. He starts to build a rally - forces Gregory out of position - puts it away - takes the match. Great to watch - "a star is born".